In these days of sky high gas prices, the most reasonable way to visit new places is through the pages of a book. Many authors go on book tours and that requires extensive travel and many times, you still won’t be able to interact with the author. But, there is a new option which is eco friendly and it allows anyone with access to a computer to interact with authors. It’s called the virtual book tour and Mirella Patzer’s tour begins Monday June 2, 2008. In medieval Italy, two men fight for one woman who possesses the secret to an ancient, hidden Roman treasure. Bloodstone Castle stands sentinel on the shores of the Ligurian Sea. Secreted somewhere in its dungeons is an ancient Roman treasure of immense value. Contessa Morena of Bloodstone Castle possesses a mysterious bloodstone pendant, the only proof the treasure exists. Since childhood, she has been promised in marriage to Duke Ernesto of Savona. Ernesto is a desperate man, a gambler who has lost his family’s fortune, a man who resorts to murder, not once, not twice, but three times to keep from paying his debts and to hide his dirty secret. Marriage to the lovely Morena will make the treasure his and restore his power and desperate circumstances. After the brutal murder of his father, Duke Amoro of Genoa swears two oaths. The first is to avenge his father’s death. The second is to honour his father’s dying wish and wed Morena of Bloodstone Castle and end the violent feud with between their two families. He severs his affair with his mistress, Laria, and departs for Bloodstone Castle to propose to Morena. But Morena refuses to marry him. Her life thrown into chaos, Morena must choose between obligation and honour, truth and lies, good and evil. She must honour the betrothal her father arranged with Ernesto. Amoro continues to try to convince Morena otherwise. Ernesto arrives at Bloodstone Castle to claim his bride, but finds Amoro there. The two men confront each other with much animosity. Books are one of Mirella Patzer’s obsessions, especially those that pertain to medieval eras and with Italy as a backdrop. To fulfill a life long dream, she began writing several years ago and has never looked back. Since then she has published several short stories and completed two novels with several more novels in various stages of completion. Her fascination for women of history and Italy is often reflected in her work, blogs, and website. When she’s not immersed in research or writing or blogging, Mirella works as an editor for Enspiren Press. She writes from her home in Cochrane, Alberta, Canada, surrounded by her husband, two college-bound daughters, and a rambunctious little grandson who frequently interrupts her work with a variety of unanticipated, yet humorous calamities and interruptions. For her, life couldn’t get any better. During the tour, we encourage people to visit each tour stop shown on the schedule. Each comment on any of the tour stops is an entry in the book giveaway. Several copies of Bloodstone Castle will be given away at the end of the month. One will be given to the “best” comment, one for the “most unique and relevant” question. In addition, the blog host where the winning comments were posted will also win a copy of the book. So, visit Mirella, learn more about Bloodstone Castle and post comments. Mirella looks forward to getting to know her readers. 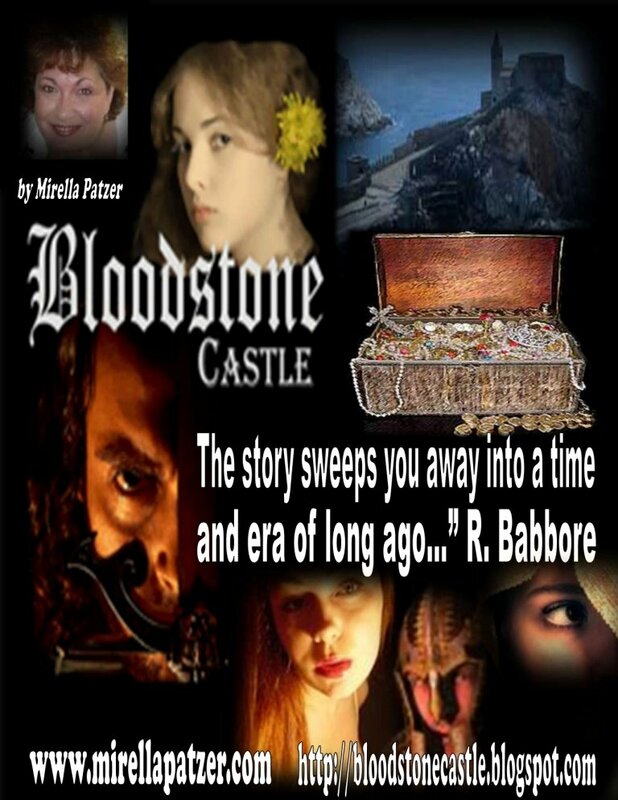 Mirella Patzer is traveling around the blog world in June to promote her new book Bloodstone Castle. This page contains her tour and I will updating and adding new blogs throughout the month of May. Check back for new entries – her tour will kick off June 2nd. The schedule is complete and will keep you up to date on where you can learn more about Mirella in June. Bounce Back Giveaway – Your Turn To Share Your Story of Glory! 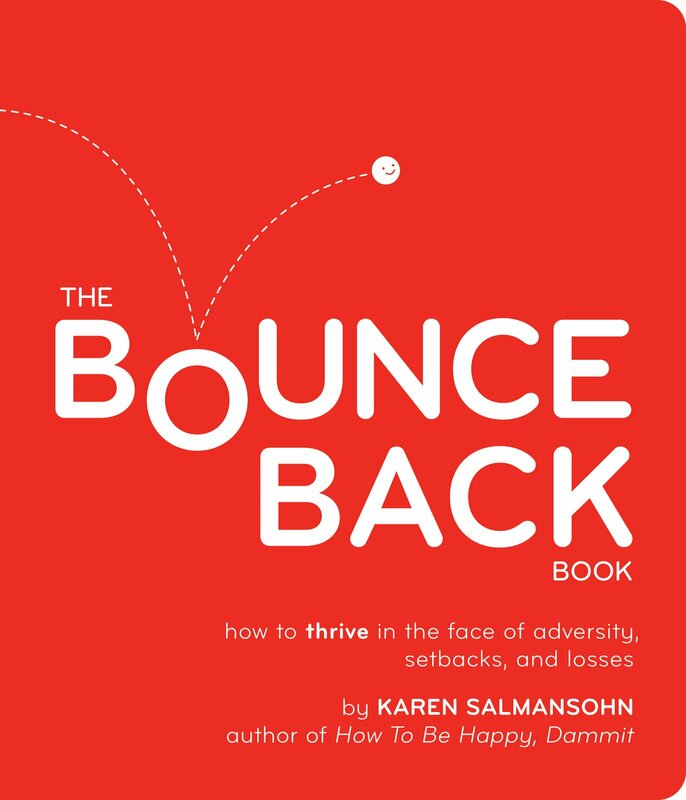 This week my newest book hits store shelves — THE BOUNCE BACK BOOK — which has a red rubber cover on the outside and inside tips on HOW TO THRIVE IN THE FACE OF ADVERSITY, SETBACKS AND LOSSES. This book is an absolute labor of love, inspired by a challenging time I went through, and includes all the empowering resiliency psychology tips which helped me, so I might help others. It’s my mission to give people going through tough times valuable tools to bounce back stronger, happier, wiser! Basically, if you’re going through a tough time …with a bad break up, illness, career challenge, you name it…this book is a truly empowering resource. Simply buy THE BOUNCE BACK BOOK before July 1st and send me the proof of amazon receipt to notsalmonstaff@notsalmon.com and you will be given access to a secret library on my site which will have downloadable podcasts from my BE HAPPY DAMMIT Sirius show — informative personal conversations with some of the greatest happiness and career success authors in the world, like Tom Peters, Marshall Goldsmith, Tom Rath etc. The tour schedule for Karen Salmansohn’s Virtual Book Tour is posted on this page – there will be some additional tour stops posted, so check back for additions. Click here to sign up for the newsletters ahead of time to learn more. The last week in May, the Bounce Back virtual book tour will begin. This is your chance to visit with Karen as she travels the blog-o-sphere to talk about her book and to share tips on becoming more resilient – how to bounce back from the adversity and problems we encounter in our lives. In The Bounce Back Book the dynamic author whose quirky self-help books-including How to Make Your Man Behave . . . and How to Be Happy, Dammit-mixes from-the-gut wisdom, humor, feistiness, and sophistication to create a hip, inspiring resource that will brighten the darkest mood. The book is grounded in happiness research, psychological studies, Greek philosophy. And it delivers: Here are 70 easily digestible, potentially life-changing tips on how to bounce back from adversity, each on a spread that’s as punchy in look as it is powerful in message. “Shrink negativity into nuggetivity.” “Think of yourself as the type of person the world says yes to.” With its attitude, techniques, and advice on everything from exercise to staying connected, it is a full-on guide to moving forward with great positive energy. Karen Salmansohn is an ex Senior VP ad creative director (at age 26) who left her job to pursue her passion of writing – and is now a best selling author with over 1 million books sold. Basically, she creates self help books – for people who would never be caught dead reading self help books. Or self help books you can give as a gift – and not get slapped, because they look kinda cool. Tell us about yourself – where you are from, how you got started writing, what you do when you are not writing (or anything you want our readers to know) I’m a former journalism major who switched to got married, switched to business and began to raise a family. I became serious about my writing in my forties and wrote my first novel which won first place in the Arizona Authors Association novel writing contest in 2000. What inspired you to write your first book? My first novel, Class of ’68 was inspired by the year I graduated from high school, one of the most tumultuous years of the twentieth century. I wanted to write a book that captured the horror of war, despair of the assassinations of Martin Luther King and Robert Kennedy, and the end of the idealism of the sixties. How many books have you written? I’ve written six novels. Three came out this year, Try and Catch the Wind, the first in my Casey Bannister series, Class of ’68 and Secrets of Sheridan Manor, the second in the series. My fourth novel, Cold File, comes out September 1. Two more next year, the third in my series, Cuts Like a Knife and a spinoff of that series, called Ramblin’ Man. I’m currently finishing my seventh, a suspense novel called Scorpion Bay. How do you decide on their topic? After Class of ’68 I focused on writing the types of books I like to read, mystery and suspense thrillers. The series that began with Try and Catch the Wind focuses on a former NYPD homicide detective struggling with retirement and his wife’s death in upstate New York. In many respects, the setting of the series gave direction to the novels. What works best to keep you focused and on track? What’s kept me on track most of the time is belonging to a critique group. We meet weekly and if I don’t have a new chapter to turn in, I feel like I’ve let them down. Keeps me on my toes. Do you write to make money or for the love of writing? Since my publisher is small with limited distribution, I’m definitely not in it for the money, but I love creating novels and would never want my writing to become work. What are some traditional methods of marketing you have used to gain visibility for you and your book(s)? I’ve enjoyed book signings. It’s quite humbling when people take time from their day to come see you and purchase your book. I’ve had good success with media coverage, three newspaper articles, a radio, a web chat, and a television interview. I have a nice website, www.mjmurphy.com that emphasizes my books, not me. What are some unique methods? I’ve really jumped into the My Space phenomena, and have “met” people from all over the world who have purchased my books. They’ve becomes some of my biggest fans. Do you sell through a website? My website routes readers to amazon.com or my publisher’s website, www.wings-press.com. Do you plan on writing additional books? I’m looking forward to putting the final polishes on my seventh novel, Scorpion Bay. Then I’ll jump right back in with a new one. I will continue my Casey Bannister series, but next I’m going to tackle something new, but still in the suspense/thriller genre. You have been invited to share your experience with our readers. What do I want people to know? Mainly that I should serve as an inspiration to them. If I can achieve any sort of success in the world of writing, speaking, and promotions, then anyone can. I’m originally from central Louisiana and I’ve moved around a bit due to my career-induced A.D.D. I love communication in any form and writing is my true passion. Since I was four years old I’ve been telling people I would be a writer when I grew up. Well, either that or a singing veterinarian who fights fires and solves mysteries in her spare time. That career lost a little interest to me when I hit six years old. That’s when I got a typewriter. As far as writing goes, I’ve done everything wrong. I wrote columns for free. I self-published first. I quit my day job. I write numerous books at one time so I don’t get bored with any of them. My first draft is often my final draft. I do ridiculous stunts to draw attention to my books. And I would do it all again … for nothing … which is pretty much the amount I’ve made after all the expenses are subtracted. At four years old I wrote an incredible novel titled, The Lion Who Tamed the Man. Well, it was incredible because it didn’t have a whole lot of words. Mostly scribbles, pictures, and an occasional smear of Hershey Bar. But it was well received by the critics in my house and from that moment on, I was hooked on writing. I was raised in a house where writing was as natural as breathing. My parents owned and ran a weekly newspaper. Instead of a bassinet, I slept in the bottom drawer of the file cabinet of The Pineville News. How could I not write? When I was six, my parents gave me a cast iron Royal typewriter. I promptly took over the hot water heater closet at the house and turned it into my office where I wrote novels, short stories, and the typical angst poetry once I hit puberty. I think that was around the age of 20. Five. Two humor. Three nonfiction business titles. The first was my self-published book, Journal of a Midlife Crisis. It was picked up by a publisher after I built up some good numbers on it. Then it was expanded, rewritten, and adapted to become Three Feet Under: Journal of a Midlife Crisis. My business books are Succession Planning Basics, Presentation Skills Training, and Manager Skills Training. The humor books are based on everyday life. I realized that I had gotten to a wonderful point in life where I was starting to get comfortable in my own skin. In fact, I was actually proud of my love affair with elastic waistbands. So it seemed time to share that joy with the world. I started these books as humor columns for newspapers and magazines. Then I looked at a pile of those columns I had written and said, “Wow, that looks like a book.” And behold, it magically turned into a book! The business books were selected through a void in the market that was recognized by my new publisher, ASTD Press. Those are some really cool people to work with. They weren’t even scared off by my chicken suit. Writing quickly and in long shifts. I have the attention span of a gnat, so once I get started I have to keep writing for a long time. That’s because once I get up from that chair, I will have to re-read most of what I wrote just to remember where I was and get started again. That’s why I avoid stopping until something like a call of nature or a cat gnawing on my toes in hunger makes it impossible to go on. And if I see a shiny object, I’m lost from my writing for the day. I also like writing short format materials. My columns are just long enough to keep my attention and I think much of the world shares that short attention span today. So, my writing ends up making a good bathroom book. As long as that’s the only use for it in the bathroom, I’m happy. It’s not on quilted paper, so I think I’m safe on avoiding other uses. I’d write even if I didn’t make money from it. And it’s a darn good thing, because quite often I don’t. I love writing. I couldn’t stand not to write. It’s my form of therapy and it’s so much cheaper than a psychiatrist. I do business writing too and that’s great because the speaking, training, and consulting from that writing brings in a lot more cash than my humor writing. And I like the idea that what I write helps people in the business world. I write training manuals and books that remind people to treat each other with respect. And my humorous side sneaks in and reminds them that a rubber chicken can be a very useful tool in a board meeting. (You’ll have to read my book to find out how!) So, I get the best of both worlds. I’ve used the basic methods of sending press releases, calling for television and radio interviews, and sending out ready-made feature articles and have gotten a really good response from this. I created a folded handout that includes chapters from my books that I use in my presentations. I am a columnist and include a tagline in all my columns that promotes my books. I have more designs for bookmarks than I care to admit. And I spent my entire time at BookExpo America wearing tacky shirts that promoted the book and said, “Will Speak for Food”. Are you sure you want to hear this? It’s more than a little scary. on idea right now to do a “mall tour” because I can create promotional events with malls and I can shop at the same time. Sounds like heaven to me. I have a link to places you can buy the book on my website. I believe that web presence is something on which I haven’t focused enough. That’s part of the reason for this tour. It’s giving me an opportunity to start making better use of the web as a forum to visit with potential readers. I have begun to create humor and business podcasts and podtrainings for companies and will begin to compile these on my site as well as additional related merchandise. Whether I want to or not and whether they get published or not, I will continue to write books. The next book will be completed by November 30th as part of National Novel Writing Month. It’s titled, “In Celebration of Elastic Waistbands”.